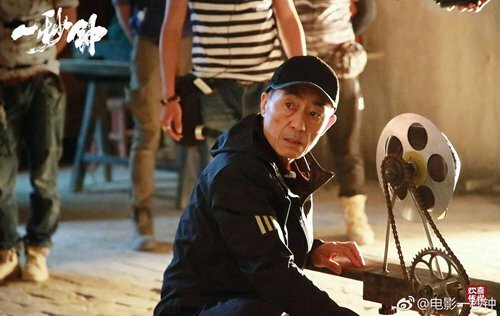 Zhang Yimou: Photo: Courtesy of official Sina Weibo account of One Second. Chinese movie fans expressed huge disappointment with the removal of famed director Zhang Yimou's film, One Second, from the Berlin International Film Festival. The film's Sina Weibo account declared on Monday that it was unable to show during the festival over "technical problems." The film was scheduled to premiere on Friday at the 69th Berlin International Film Festival, according to the festival's website. The movie's Weibo account announced on February 1 that it will be shown in Chinese cinemas. Many Chinese netizens were disappointed with its removal, but looking forward to its release in China. One Second, a story of a movie fan in a remote area who strikes a relationship with a homeless girl, is set during China's Cultural Revolution (1966-76), during which people suffered from material struggles and spiritual barrenness. "Director Zhang Yimou was sent to the countryside as a young man during the Cultural Revolution, an experience he has explored in many of his films," said the festival's website. The Global Times on Tuesday found on the website, "Unfortunately the screening had to be cancelled," read the notice on the One Second introduction page. The festival will instead show another of his previous films Hero, a martial art movie. One Second is the second Chinese film to be withdrawn from the festival after Better Days, which was directed by Derek Tsang from Hong Kong. About disaffected youth and a mysterious death, the film was scrubbed from the festival's generation section earlier this month. The film's Sina Weibo account said that the cancellation was due to "post production problems." Many movies about the Cultural Revolution were shown in China since the reform and opening-up. Coming Home, also a movie with the Cultural Revolution as a backdrop directed by Zhang, broke many records since its release and hit nearly 300 million yuan at the box office.